The assailants fled on a motorcycle after spraying a hail of bullets at Gauri Lankesh on Tuesday night as she was leaving her car outside her home in the Karnataka state capital. Police said they were searching for leads, but that it was too early to say who killed her. Top police officer R.K. Dutta said he had met Lankesh recently, but that she did not mention any threat to her life. Members of Indian journalism associations expressed outrage and said they would protest Wednesday afternoon in New Delhi. "The silencing of a journalist in this manner has dangerous portents for democracy," the Indian Women's Press Corps said in a statement. Lankesh, 55, was the editor of the independent Kannada-language magazine "Lankesh Patrike." In November, she was found guilty of defaming lawmakers from the governing Bharatiya Janata Party in a 2008 story - a case she said was politically motivated, vowing to challenge her conviction in higher court. India has seen a string of killings in recent years targeting independent journalists and critics of religious superstition, stoking worries about the rise of extremism and intolerance in the secular South Asian democracy. In 2015, scholar Malleshappa M. Kalburgi was shot dead at his Bangalore home, following death threats from right-wing Hindu groups after he criticized idol worship and superstitious beliefs by Hindus. Earlier that year, Indian writer and anti-superstition crusader Govind Pansare was shot dead while taking a walk with his wife near their home in western Maharashtra state. And in another daytime attack in 2013, two assailants shot anti-superstition activist Narendra Dabholkar dead while he was out for a walk in the Maharashtra city of Pune. Within hours of Lankesh's killing Tuesday night, Indian politicians from all parties condemned the attack. 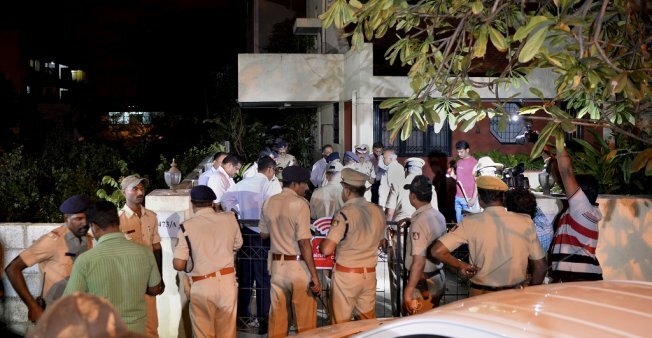 Karnataka's Chief Minister Minister Siddaramaiah - the state's highest elected official - called the death "shocking" and said three police teams were investigating. Lankesh's brother said he hoped the culprits would be found and prosecuted. "I do not know how to react. The assailants should be brought to book," he said, according to Press Trust of India.